Here is the Cobb-Hepburn House coming down. 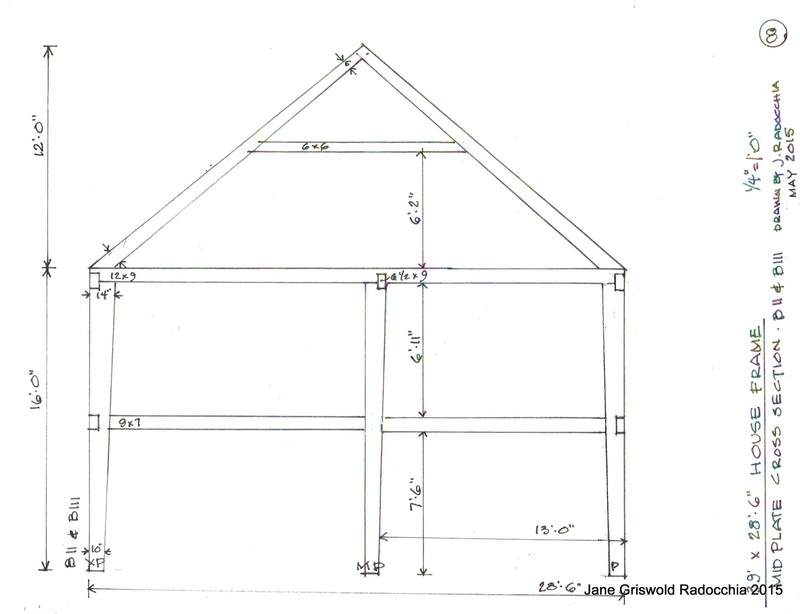 Glenn Tarbell recorded its dimensions as he and his crew dismantled the frame this past winter. 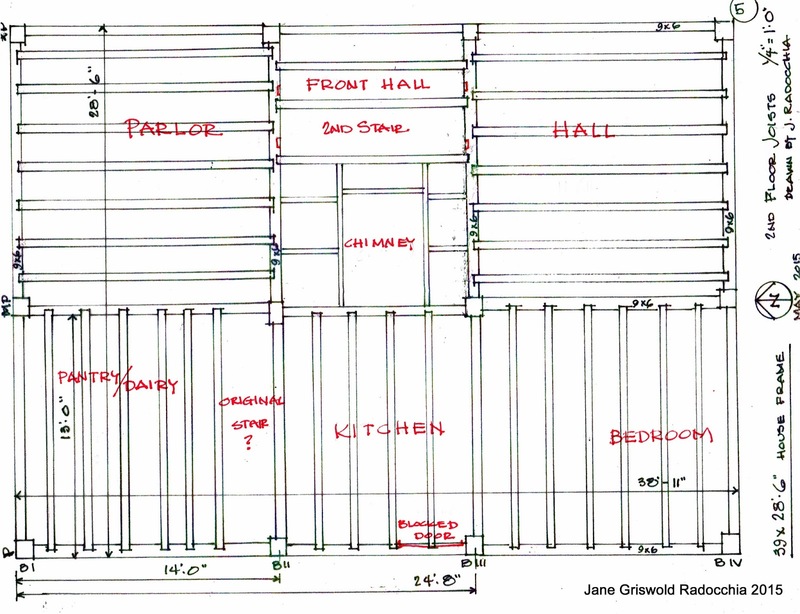 I drew the framing diagrams. 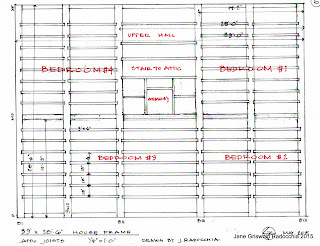 My measured drawings of the house before de-construction served as a reference. The drawings tell a lot about how the house evolved. Local records show that Charles Miles came to Tinmouth from western Massachusetts. He built this house about 1780. When he moved to Ohio about 1810, he sold the farm to Amos Brown. In 1821 Brown sold it to his son-in-law, Edward Cole. His daughter, Jane Cobb, inherited the farm and house when Cole died in 1852. Hod Hepburn was the last owner who lived in the house. 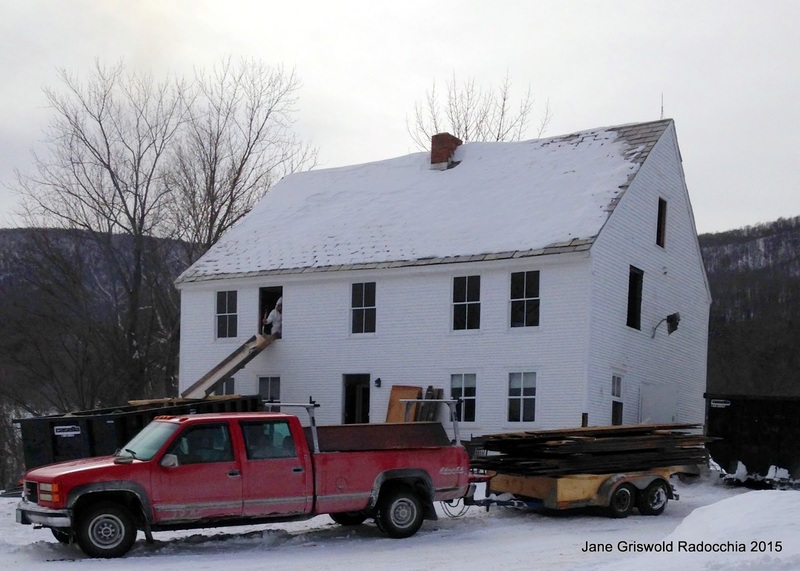 After he died the new owner asked Green Mountain Timber Frames to take down the house. 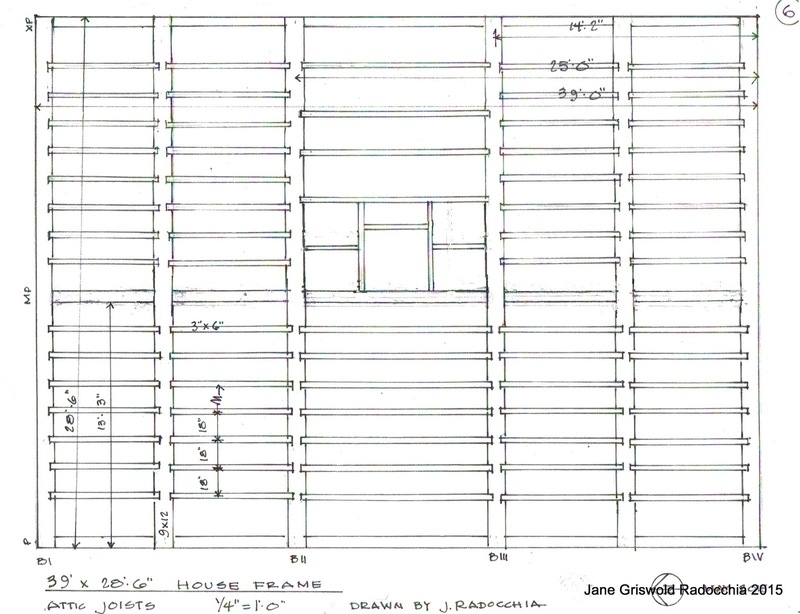 The house is 28'-6" wide by 39'-0" long, 2 bays (3 bents) wide and 3 bays (4 bents) long. 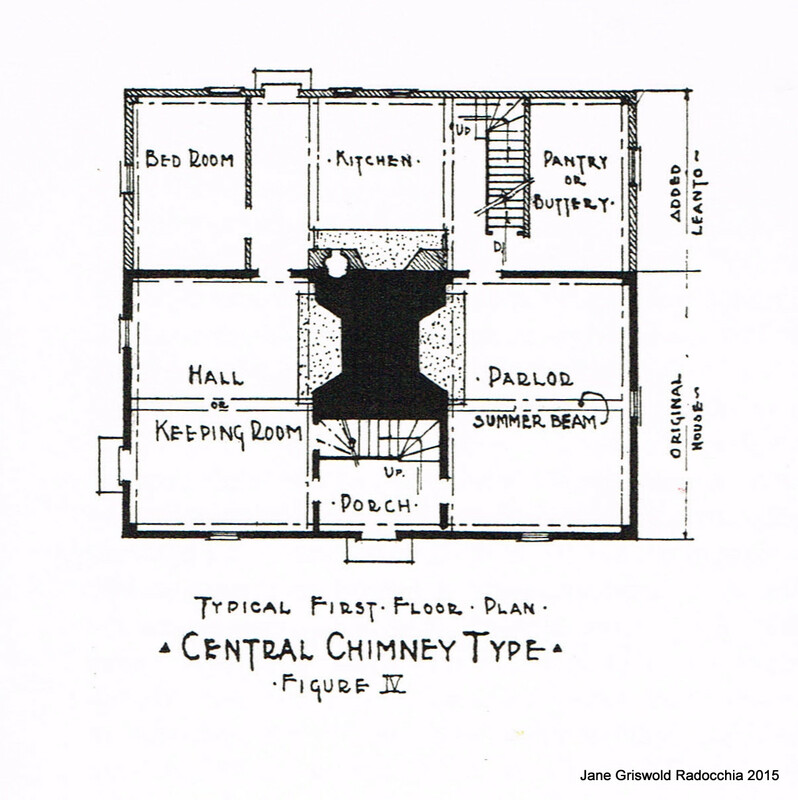 Center chimney floor plans were rarely built in seacoast New Hampshire and Massachusetts after 1760. 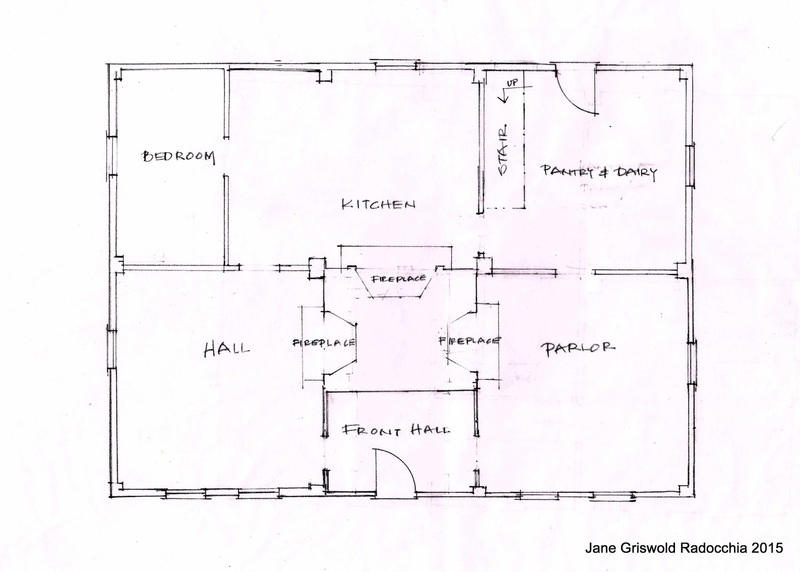 However, the first floor plan often appears in 2 story houses in New Hampshire and western Massachusetts up to 1770 and is a common plan for 2 story houses in Vermont through the 1840's. The drawing is by William Lawrence Bottomley from his introduction The Architectural Heritage of the Piscataqua, John Mead Howells, Architectural Book Publishing Company, Inc. 1937. His 10 page essay is one of the best introductions I know on early construction on the New England Seacoast from Salem, MA, to Portland, ME, . 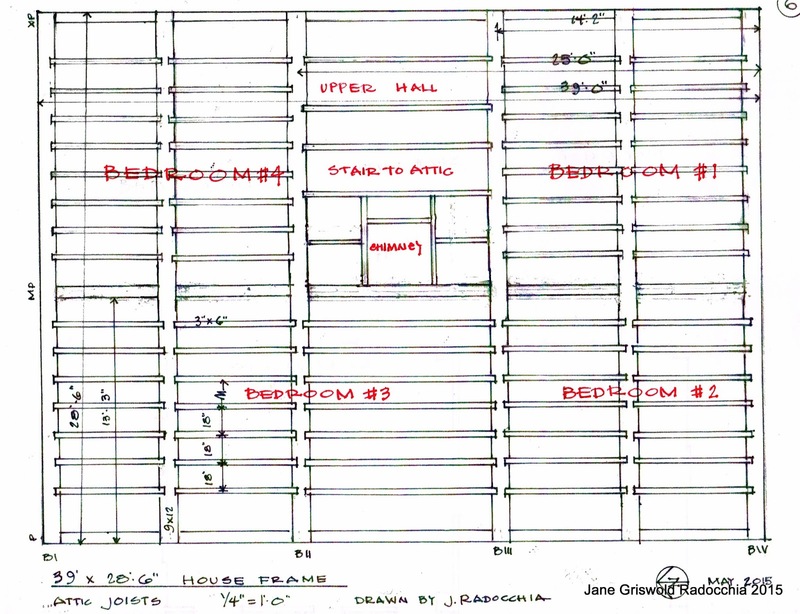 Here is the probable floor plan for the Tinmouth House. I have labeled the rooms to match Bottomley's drawing. 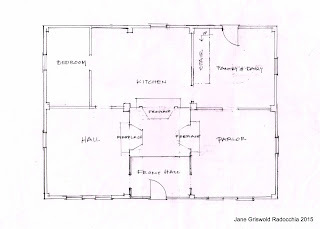 The kitchen and the pantry/dairy had been divided into smaller spaces by the time I measured the house in 2015. The other rooms still existed. 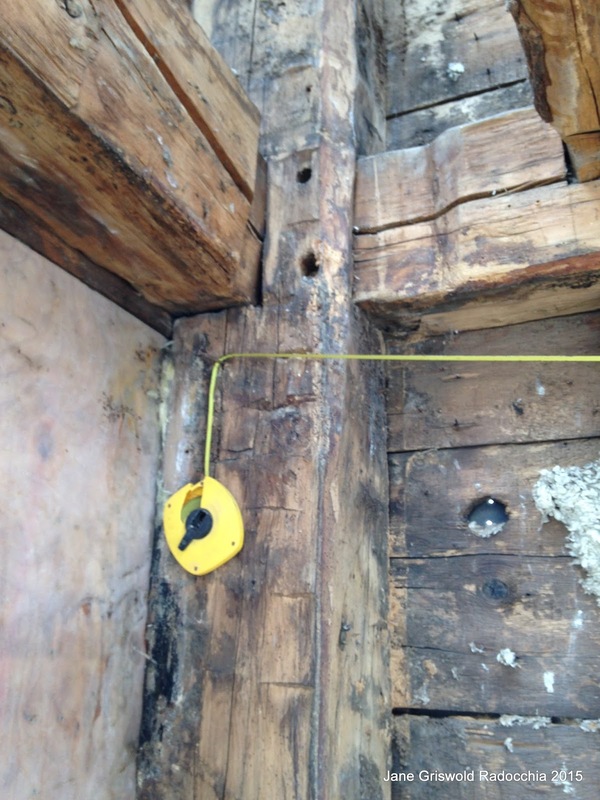 The first floor joists and sills were too rotted to be saved. 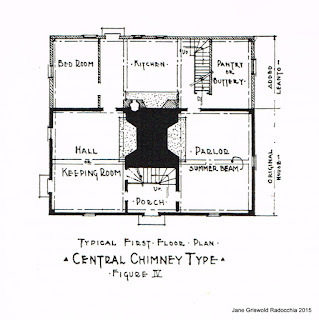 The actual location of the original fireplaces is educated conjecture. A bake oven may have been beside the kitchen fireplace - we uncovered a mantle and cabinet door set in that wall. The frame is massive, 10"x 10" posts rising to 10"x 14" and 10"x 16" gun stocks. The beams are 6"x 9", the plates 12" x 9". This is the 2nd floor SE corner seen from the 1st floor. The roof rafters are of similar heft. 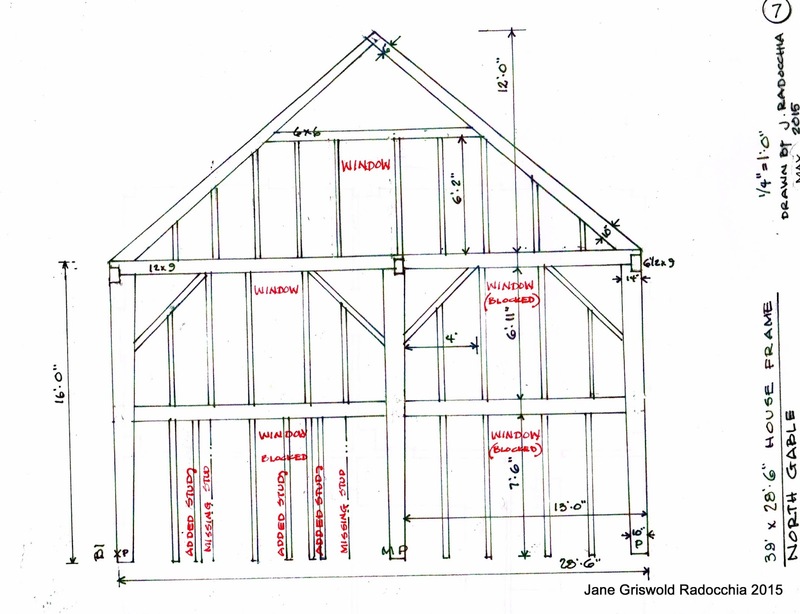 The basic house frame was erected all at one time. Completing the interior frame took about 50 years. 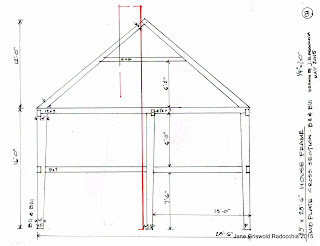 The way the framer set back the longitudinal center bent - about 12" from the center - allows the chimney (drawn in red) to rise through the roof at the ridge. 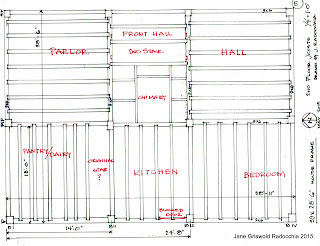 The frame for the north wall has missing and added studs as well as blocked windows, showing how the house was changed through the years. The original 1st floor windows were directly below those on the second floor. 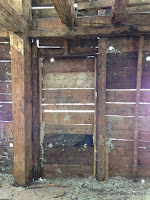 The west wall framing also shows window openings where we found no sash. A door was added at some point and then closed off. A stud pocket remains in the beam above. Empty joist pockets at the stair opening in the front hall indicate that the frame was reconfigured to allow space for the narrow, steep stair to the 2nd floor. 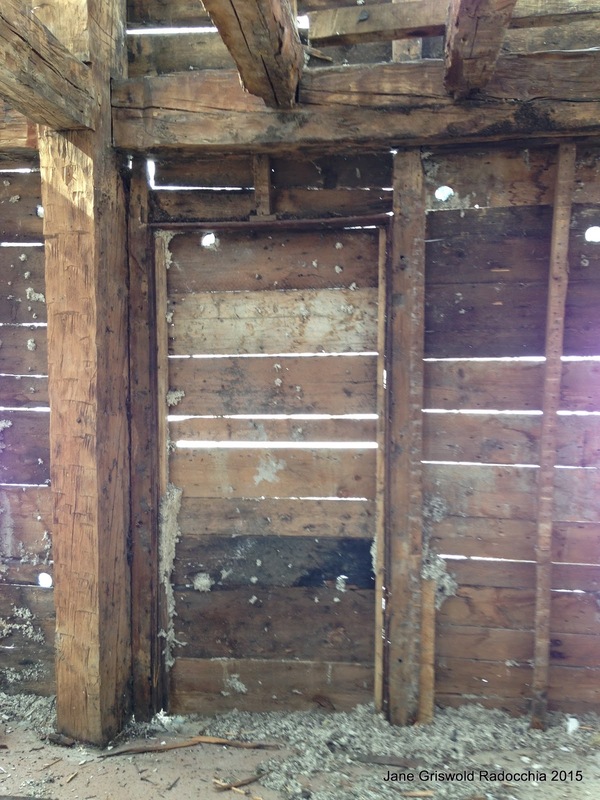 The second floor joists were made at the same time as the original frame. 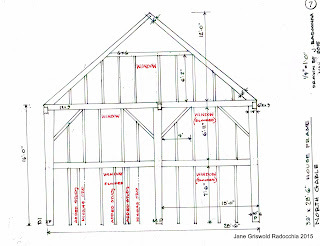 The Parlor, Hall, Bedroom and Kitchen joists are regularly spaced. The pantry/dairy joists aren't. Quite a few of the joists have bark and wane; those above the parlor and the pantry/dairy are more logs than hewn. The larger space between joists beside BII may indicate a stair. Charles Miles framed the house. He finished the Hall, Parlor and Kitchen; the Bedroom (which was usually reserved for the infirm or new mothers). Then he ran out of money, time, or energy. He finished the last joists with rougher wood. His family lived on the first floor. Living in a partially finished house was not uncommon. Sections of a house were often used for storage and then added into the living space, just as we today add dormers to attics and insulation to porches. 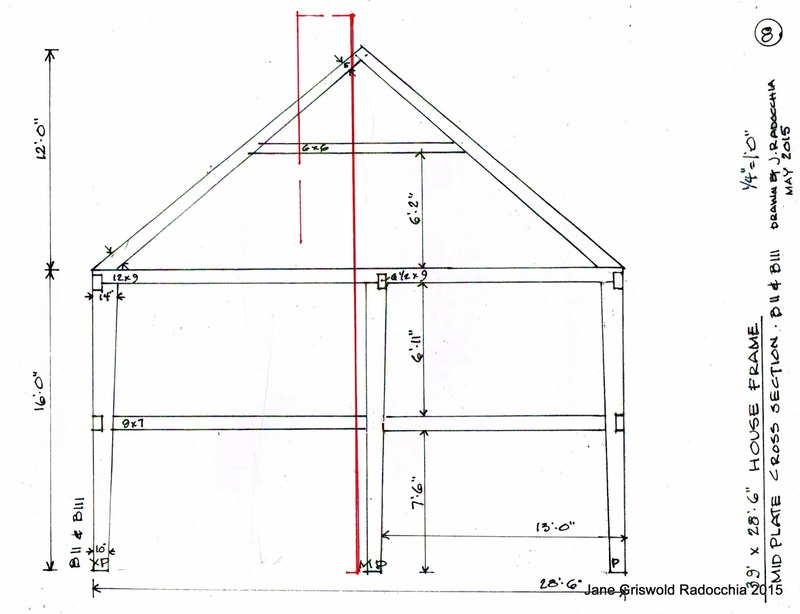 The attic framing was a different pattern: joists 2'-0" oc with intermediate 12" x 9" plates. The joists all match: 3"x 6", cut by a sash saw at a mill. The stair was relocated to where we found it. As the frame was exposed we saw that bedrooms #1 and #2 were once one room, that bedroom #4 had neither lath nor plaster while the other rooms were finished. Which owner installed the attic floor? The answer might depend on when sawn joists were readily available from a local mill. 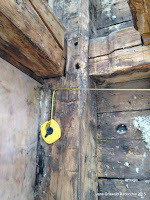 The photograph shows the attic floor joist pattern. The window to the right had been blocked, but its outline was visible in the plaster wall. The window to the left was not original:the cut stud above and the lack of a stud on the left side were the signs of later construction. Probably the Coles eliminated the fireplaces. Cast iron stoves were being manufactured in the 1820's.They were widely used by 1840. After stoves came central heat.We dismantled a modern cement block chimney serving a furnace and a modern wood stove. Soot and char on beams implied that the framing around the chimney coincided with the installation of wood stoves.